We currently have a set of documents that are printed from a shared folder on our file server daily, at the moment a member of staff uses Print Conductor to print the documents, then moves the files to an archive once completed. If we could set up scheduled printing then I could schedule the moving of the files to an archive after the printing has completed, which would automate the whole process. An easy way to have 2Printer automatically print your files is to schedule all the necessary commands written in a batch script file. It is not as difficult as it sounds, really. A batch script file consists of a series of commands to be executed by the command-line interpreter, stored in a plain TXT file with a file extension .cmd or .bat. This extension runs with DOS and all versions of Windows, under Command Prompt or cmd.exe. Although batch files (*.bat) are covered in this guide, other scripting languages may also be used. 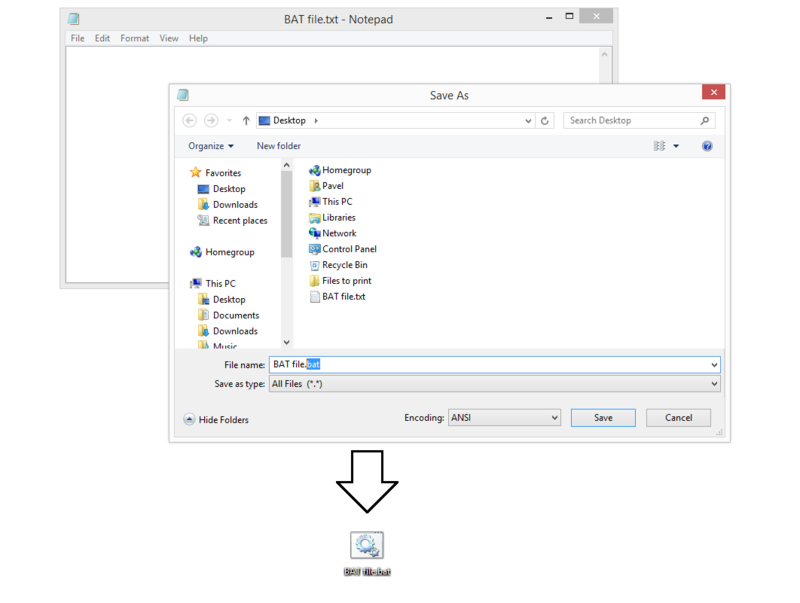 First off, create a folder, where you will input files to be printed, e.g. "С:\Files to print\". 2Printer.exe -s "С:\Files to print\*. *"
move /Y "C:\Files to print\*. *" "C:\Processed"
*. * selects all filetypes to be processed. Instead of *. * value you can set, for example, *.pdf or *.txt , and only these filetypes will be processed. 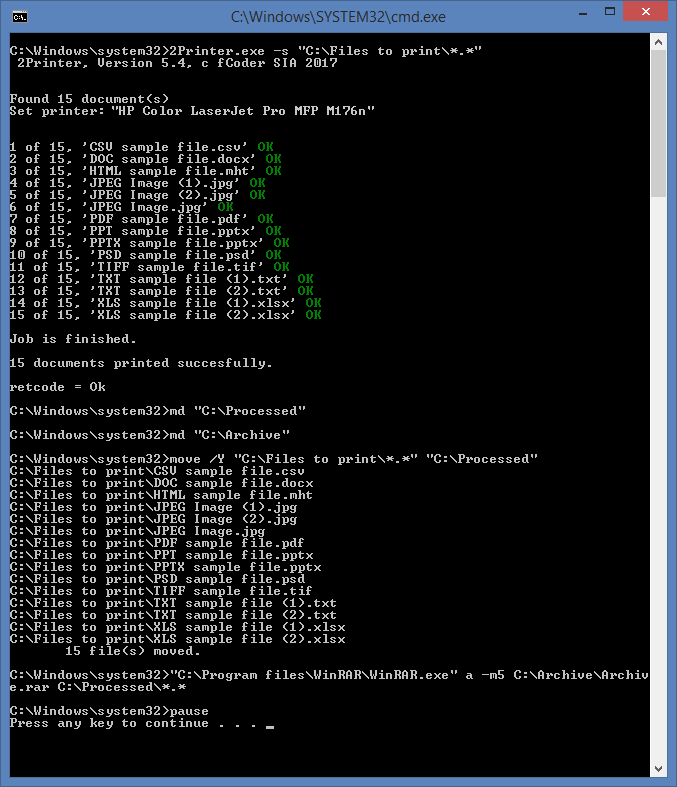 If you want to print your files on a specific printer, add -prn value in the first line: 2Printer.exe -s "С:\Files to print\*. *" - prn "[Printer’s name]"
The "pause" line is also optional, use it on initial setup to check that everything is ok. It will pause the command line in case of any mistake in syntax or once the task is complete. When you see that everything works fine, you may remove the "pause" line. We have our batch file saved, now we need to schedule it - when or on what condition the file will be launched. 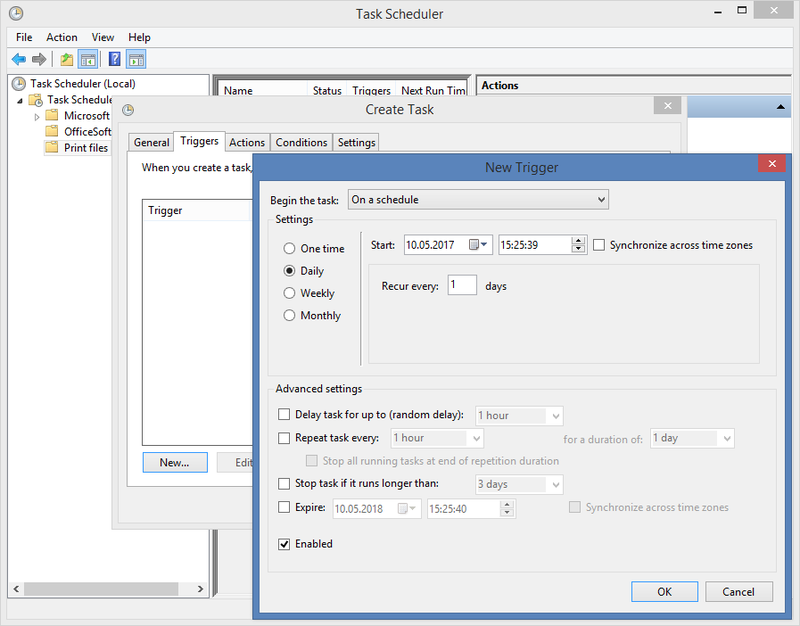 Start Windows Task Scheduler. 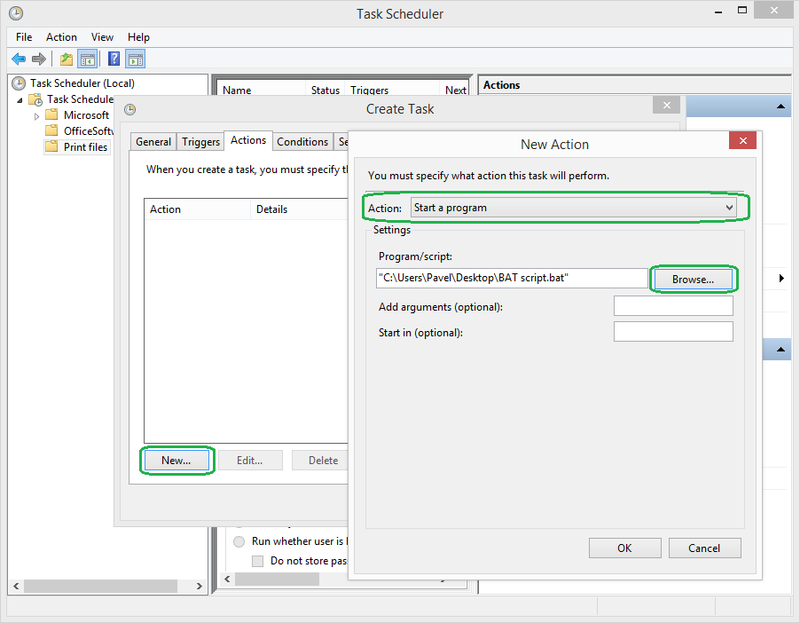 You will find it at C:\ProgramData\Microsoft\Windows\Start Menu\Programs\Administrative Tools or if you press Windows Start button and start typing "Task Scheduler" in "Search programs and files" menu. 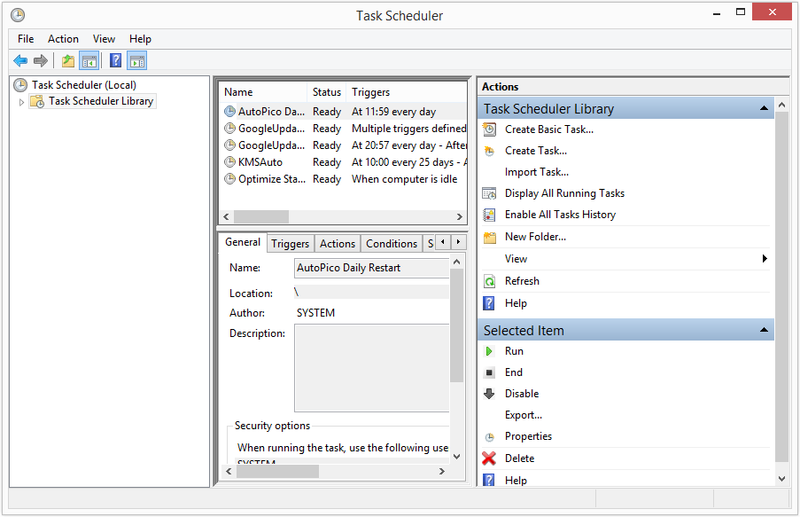 Or you can just launch the Command Prompt (Win + R), type in "Taskschd.msc" and press Enter. NOTE: We recommend to put a check next to "Run with highest privileges" to ensure the task works fine, no matter what user status you have in the system. When do you want your files printed? 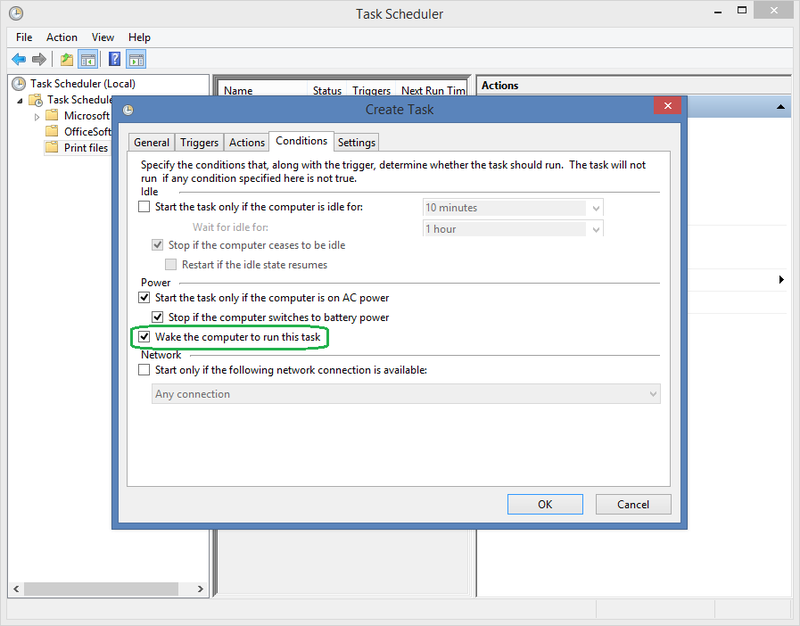 Using 2Printer combined with Command Prompt, Windows Task Scheduler and other applications gives you endless options to set up your own work system the way you like. As always, feel free to contact us, if you encounter any difficulties on your way.